HCM CITY — Vietnam House Restaurant, helmed by internationally-celebrated Chef Luke Nguyễn, will offer a special Valentine’s Day dinner including a complimentary “Endless Love” welcome cocktail on February 14. 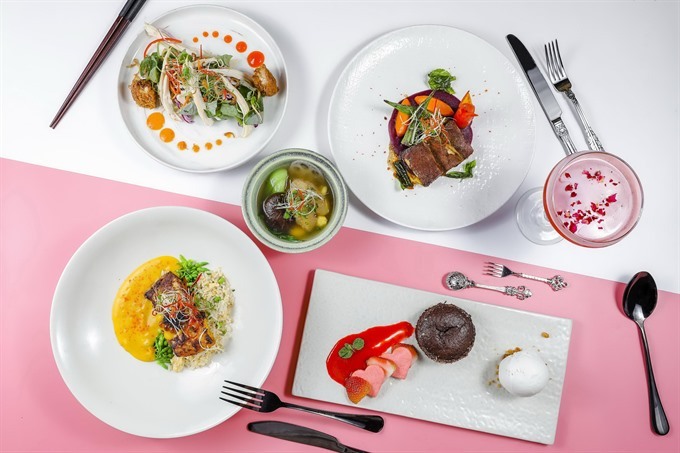 Diners will enjoy a fabulous five-course dinner starting with banana blossom chicken salad, followed by sea cucumber soup, a main course of Australian short rib and char-grilled sturgeon, and then an indulgent chocolate fondant. The five-course set dinner is priced at VNĐ1,488,000++ per person. Vietnam House restaurant is imbued with an atmosphere both refined and intimate that will make for an unforgettable evening. Located in a restored colonial building on the corner of Đồng Khởi and Mạc Thị Bưởi streets in the heart of the city, the venue once housed the famed Café L’Imperial in the early 1900s and was a popular destination for the city’s affluent business class. Seats are limited, so advance booking is recommended. For reservations, call (028) 3822 2226. — VNS.